It may be October, but in Indiana we are celebrating what will most likely be our last summer-like day of the year! It’s sunny and 80s outside – so gorgous. However, fall will be arriving in force tomorrow to bring us back down to earth and the reminders that winter is ever marching closer. Closer. Closer. So what better way to kiss summer farewell, than with a summery recipe? 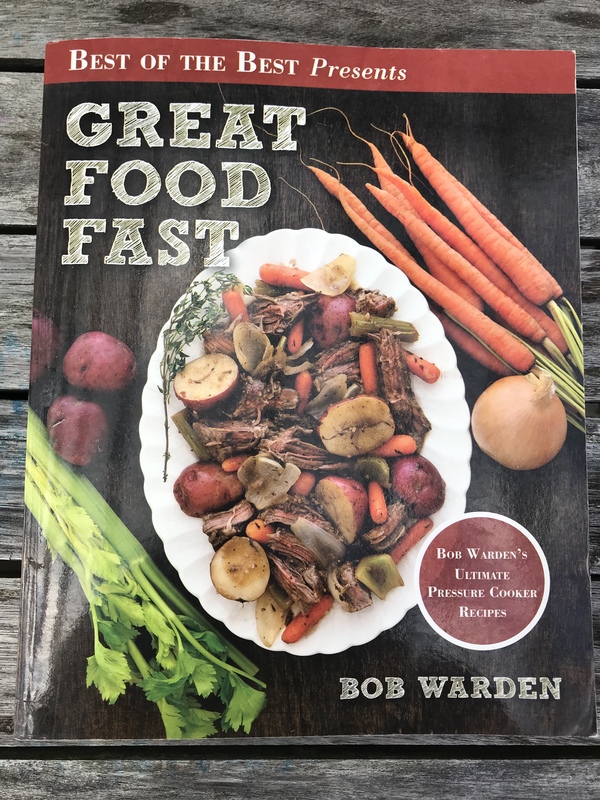 Today’s jaunt into my cookbook stash is from Great Food Fast: Bob Warden’s Ultimate Pressure Cooker Recipes. As you may have guessed from the title, this is a pressure cooker cookbook. I got an Instant Pot a year or so ago, and to be honest, I’m a little scared of it and I’ve been slow to warm up to it. Nearly every time I’ve made something I’ve gotten confused about all the settings and buttons. But in general, I have to admit that most things have turned out OK in it, particularly roasts. And last week I made meatloaf and potatoes in it (nice to only have one pot to wash!). And now, pulled pork, too! Both Steve and I were impressed with the taste and texture of this pork. It was tender and tasty and not at all dry and tough, which often seems to happen with pork. 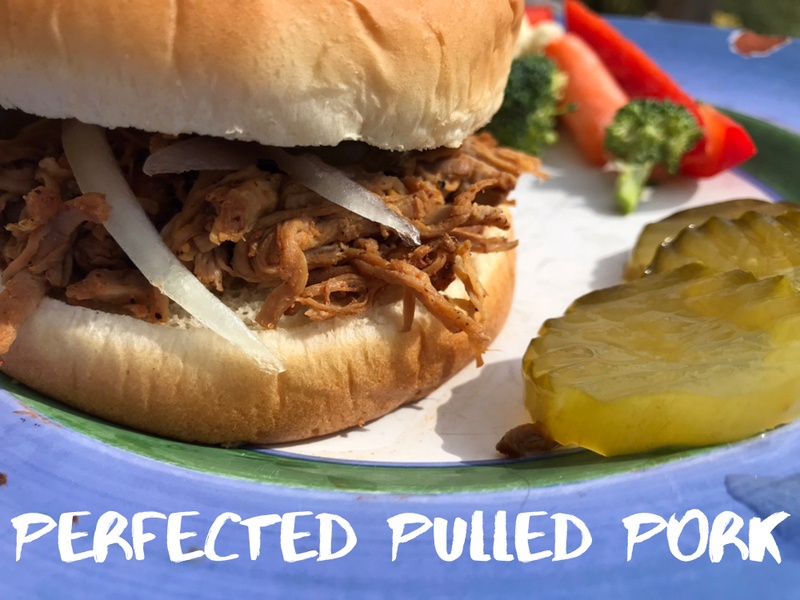 This is definitely a keeper recipe, way better than any other pulled pork recipe I’ve made with a slow cooker. 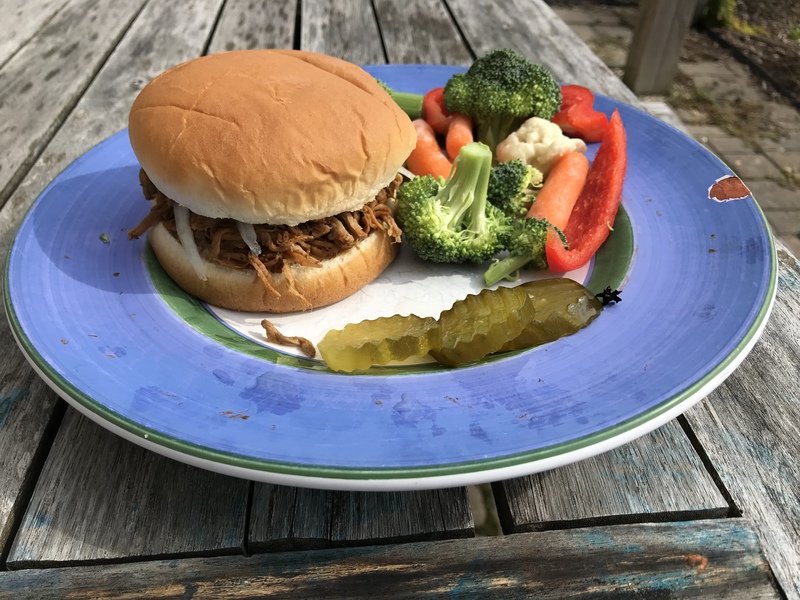 I think the secret is just how hot it gets the pork; I don’t think a slow cooker gets the pork hot enough to make it really tender We made it for our small group carry-in, and it was a hit. I like it with lots of onions, pickles, and extra sauce. And I REALLY need to be more intentional about making myself use my Instant Pot. That’s the only way I can get comfortable with it! I just saw an article the other day talking about how Indian cooks are major adopters of the Instant Pot. Maybe someday I’ll have to give a curry a try and see how it does. And there are several others in Great Food Fast that I want to try, so hopefully this book will be featured again. Cut the pork into 2-inch thick slices, to help speed up cooking process. Mix together the dry spices and rub onto the pork. Really get into it. With the cooker’s lid off, heat oil on HIGH or “brown” until sizzling. Place the pork into the cooker and brown on each side. Add chicken broth, vinegar, and liquid smoke. Securely lock the lid and set for 100 minutes on HIGH. Make sure vent is set to closed. Using tongs (And WATCH IT because the little buggers are HOT, tender, and are falling apart), remove pork from the cooker and discard remaining liquid. With the cooker’s lid off, heat BBQ sauce on HIGH or “brown” until simmering. Pull or shred pork into sauce. Do you have any go-to Instant Pot recipes to share? I’m totally open for more encouragement to use mine! Hi! Yes, instant pots make great Indian food! i made simple rice and dahl (in one pot!) and the dahl was so creamy smooth, you wouldn’t believe it. I’ll send you some pinterest links!